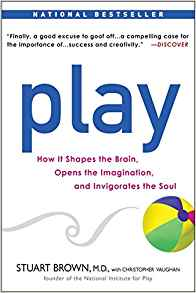 Book Review – ‘Play: How it Shapes the Brain, Opens the Imagination and Invigorates the Soul’ by Stuart Brown M.D. I cannot recall how I came across this book but I think it was something I came across on social media referring to an article in National Geographic from December 1994. So I searched for and purchased said magazine and it is a great article on animals playing, fascinating in fact how different species such as a polar bear and a husky played together, go find and read. Better still buy the book as its all in there too but without the fantastic pictures. To be fair Dr Brown is preaching to the converted with me. I love to play. Play is fun, it is a natural act but unfortunately many forget how to play as adult life takes over. In a world where the screen dominates and managed activity is all pervasive we have forgotten how to play creatively as we did as children. Many children are also deprived of the opportunity for spontaneous play as they are ferried from adult supervised activity to adult supervised activity. At our junior Ju Jitsu sessions the kids love to end with a game, it seems not to matter what the game is except the more chaotic the better. Play engages the brain and the body, when we train in the woods, what we call Wild Wednesday, the adults taking part in some pretty tough physical training are re-engaging with their younger selves as they crash about through the undergrowth, jumping over logs and throwing rocks. Having grandchildren is fantastic, I get to be Mr Wolf or just ‘the monster’, I am on all fours as a horse for them to ride and they really love the rough and tumble and we had an epic water fight not so long ago. I love to play, to me Ju Jitsu is play, padwork is play, training is play, its how I express myself, I can lose myself in these activities and more importantly play with others. I thoroughly recommend this book, the other night I was reading ‘Behave’ by Robert Sopolsky and was not surprised to see him quoting Dr Brown’s work on play. High praise indeed. Buy it and read it. Previous Previous post: Youtube Video of the Month – Why Are People Violent?